A great haul for EI Design at Davey Awards! It’s nice when you are recognized for your effort. But nothing beats walking away from an award ceremony with a bag full of awards. The award-winning streak we are on saw a major leap at the Davey Awards recently, with our two entries bagging four awards between them. The Gamified eBook – “How Gamification Is Reshaping Corporate Training” received Gold in the “Websites – Games/Games Related for Websites” category as well as Silver in the “Websites – Education for Websites” category. Our now-famous and multi-award winning microlearning nugget on Data Security – “A Date with Data Dave.” bagged Gold in the “Websites – Education for Websites” category as well as Silver in the “Feature Categories – Best Visual Appeal – Aesthetic for websites”. The Gamified eBook on “How Gamification Is Reshaping Corporate Training” helps organisations learn more about Gamification and understand how they can incorporate Gamification into their learning strategy. However, this eBook is anything but a bog-standard document. In this fully interactive eBook, readers join Pengu – a fictional character – on his journey home as he collects fish to take back to his family. This journey maps directly to the learning path of the eBook and is divided into five zones. Each zone has its own unique terrain for Pengu to traverse and ties in to different sections of the eBook. Readers need to go through each section in sequence and in the process, help Pengu get the most number of fish for his family. This eBook is a perfect example of practising-what-we-preach, and the industry recognizes it as such. Check out the solution here. 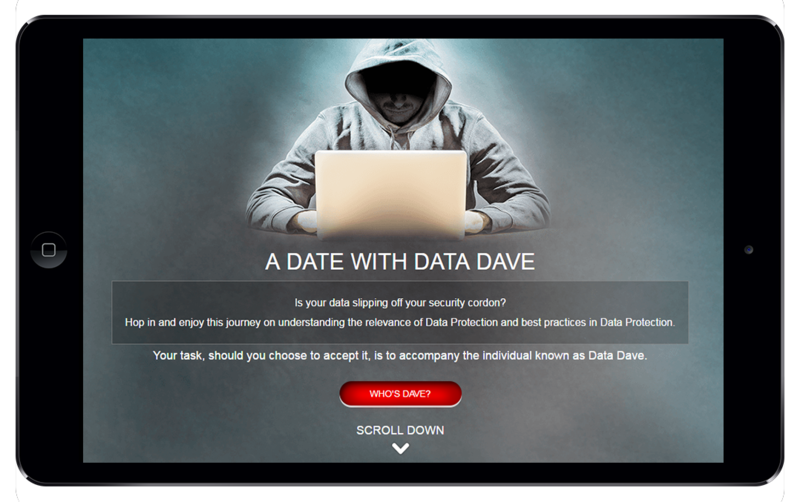 “A Date with Data Dave” is an informal Microlearning nugget on the Compliance subject of Data Security and is part of our larger suite of courses on Compliance. The information provided is a prequel to a comprehensive module on Data Security and lays the ground for it. This nugget has a responsive web-based training format called ‘Interactive parallax-based scrolling’ that is very popular with websites and is now being used as a pioneering Microlearning technique. Learners take a “scrolling” journey here in the company of a fictional character called “Data Dave.” He takes learners through three offices with varying levels of data security and provides tips and best practices to protect data along the way. As opposed to most Compliance training that is deemed “boring”, this Microlearning experience featuring engaging visuals and conversational language coupled with interactivities at various stages makes the complete journey engaging. Need a glimpse? Check out the solution here.